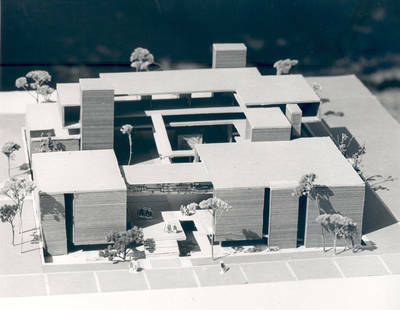 "Architectural model of Moulton Hall Fine Arts Complex, Chapman College"
Architectural model of Moulton Hall Fine Arts Complex, Chapman College, Orange, California. Completed in 1975 (2 floors, 44,592 sq.ft. ), this building is named in memory of an artist and patroness of the arts, Nellie Gail Moulton. Within this structure are the departments of Art, Communications, and Theatre/Dance as well as the Guggenheim Gallery and Waltmar Theatre. Model photographed by Rene Laursen, Santa Ana, California. BW photograph; 7.5" x 9.375"